We have been taught the adage “you are what you eat” since as long as most people can remember, teaching us to be mindful of the food that we put into our bodies to fuel our temples. A healthy diet can ward off many diseases and help heal others, keep us in peak physical and mental condition and also extend our life expectancy. What many don’t consider, however, is the diet of their pets. It can be easy to not think about pet nutrition when one can readily purchase a bag of pet food at the grocery store for a bargain, and even easier when the pet readily devours the food you give them like a Big Mac Combo on a long road trip. The thing is, that’s fairly close to what some pet foods are from your furry family’s perspective, a meal lacking in sufficient nutrition that can leave their body begging for sustenance by the time the next bowl comes around. 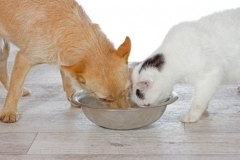 Not all pet foods are created equal, so how do you, the buyer, sort out what to feed your pet? The first step is consulting your veterinarian. Veterinarians can wear many hats, including family pet practitioner, surgeon, pharmacist, radiologist... and nutritionist. Depending on your pet’s breed, age, size, weight, previous medical or familial history or even bloodwork, your veterinarian puts together the pieces of the puzzle to sort out what nutritional needs your individual pet has and can then make recommendations to you on brands and varieties of food. Many health disorders can be mitigated or corrected by addressing the nutritional needs of your pet, including obesity, gastrointestinal abnormalities, skin and fur issues, arthritis and a host of other conditions. Many veterinary clinics sell a wide variety of pet foods that are nutritionally fortified, scientifically-proven to promote wellness and some are are therapeutically tailored to specific issues your pet may be facing. Whatever your personal preference of diet for your pet, it is important to review your choices with your veterinarian to educate yourself on the impact they may have on your pet. Particularly in the case of raw food, some diets are not to be entered into lightly and require considerable commitment from you, the owner. Mixing of different diets can also have ramifications for your pet. Educate yourself. Talk to your Vet.